I decided to be more forward-thinking this year and post some new delicious Mexican recipes early in anticipation of Cinco de Mayo, which is one of my favorite food holidays. Not that I don’t make Mexican, or Tex-Mex meals all year round, of course. I know a lot of people who are planning celebrations the weekend before Cinco de Mayo and are already asking me what they should make. I really don’t know too many people who don’t love Mexican food and it’s a great meal to make for a crowd, kids included. If you haven’t noticed, DIY parties are all the rage and Mexican menus fit the bill perfectly with their topping bars for tacos, fajitas and soups. 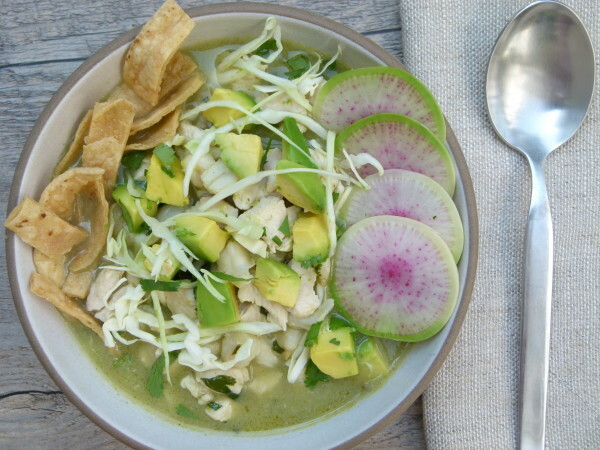 Posole is is a traditional Mexican soup or stew, which once had ritual significance. It is made from hominy, plus meat, usually pork, but also chicken or turkey or pork rinds, chili peppers, and other seasonings and garnish such as cabbage, salsa and limes and/or lemons. I have seen many recipes for posole, red or green, vegetarian or with meat, different seasonings, but there is always hominy. Hominy is an interesting food. It comes from dried field corn, also known as maize, not to be confused with sweet corn which you enjoy off the cob in the summer. The corn is prepared by removing the skins after soaking them in the mineral lime (cal), which changes the flavor (for the better) and releases the niacin, making this slightly processed grain healthier than simple dried corn or cornmeal. (I took this from the Rancho Gordo website.) Not surprisingly, cooked hominy tastes like corn tortillas, but in a form of a chewy little nugget. Quite tasty. You can buy prepared hominy which I have only seen in cans (probably lined with BPA, sadly) or you can buy dried and cook it yourself, which is what I did when I taught this in my classes a few years ago and what I still do when I want to make posole. It is an extra step for sure, so if you want this to be a really fast recipe and you don’t mind cans, by all means buy it prepared. 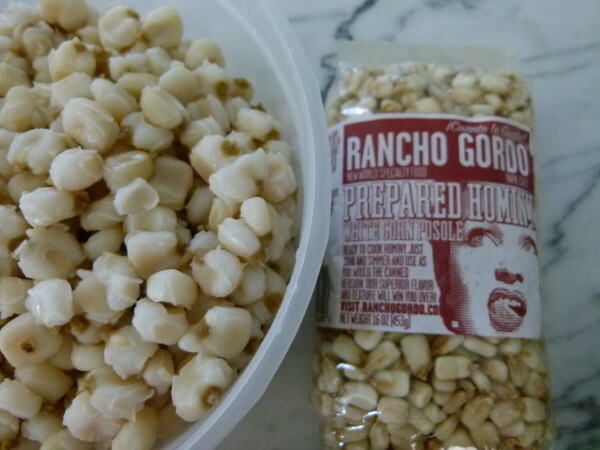 I have only seen dried hominy sold by Rancho Gordo, which is an exceptional source for dried beans, especially heirloom varieties, grains and spices. Some retail stores sell Rancho Gordo products or you can purchase directly from their website. But I know from some students that you might be able to find other brands of dried hominy in Latino markets or in the “ethnic foods” aisle of some supermarkets. When I decided to make posole for the first time, I took no timing wondering red or green. 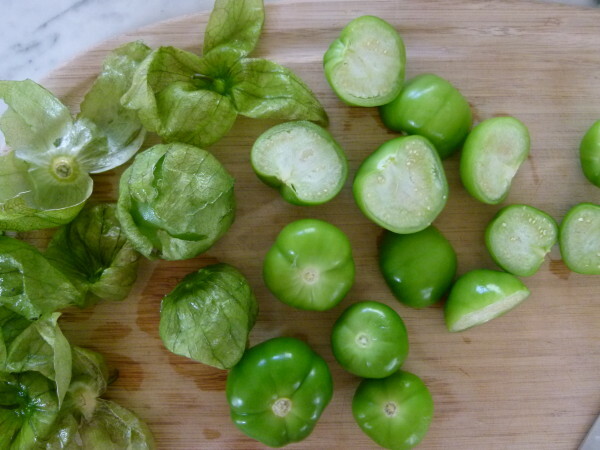 I much prefer green (tomatillo-based), especially in the spring and summer, because it’s so much lighter and fresher than red (tomato-based.) We all loved that first batch and I knew it would be great to teach in a class. I especially love setting out a topping bar for posole because all those add-ins give such great texture, color and really turn this soup into a meal. I love adding avocado, cabbage, radishes, cilantro and feta, which I think is a perfectly good, and more healthful sub for the more traditional Cotija cheese. The kids like to add tortilla chips or strips, naturally. This soup reheats well and freezes well, too. 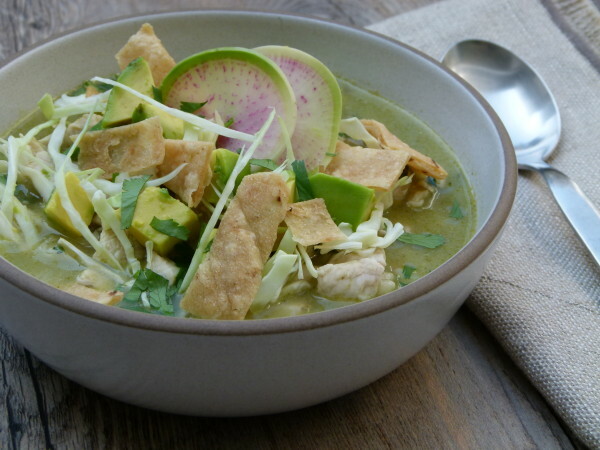 You can serve posole as a meal or with veggie quesadillas and/or Mexican chopped salad on the side. If you want this to be vegetarian, just use veggie stock and drop the chicken. Maybe add in a little quinoa or some sweet peas. 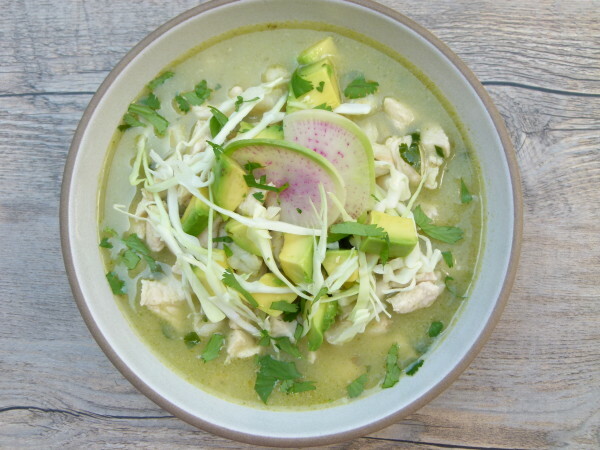 Stay tuned for more fantastic, healthful Mexican recipes to come in the next couple weeks! Combine onion and tomatillos in a medium saucepan with 1 cup of water. Bring to a boil, lower to a simmer, and cook, covered until vegetables are tender, about 10 minutes. Drain. Transfer vegetables to a blender with the chilis, garlic, ½ cup cilantro and 1 ½ teaspoons sea salt and puree until smooth. Season the chicken with oregano and 1 teaspoon salt and pepper to taste. Set aside. Heat oil in a large saucepan over medium heat. Pour puree into the pan and lower heat to medium low. Cook, uncovered, stirring frequently, until thickened, about 10 minutes. Add the broth, hominy and chicken to the saucepan. Cover and simmer until the chicken is tender, about 10 minutes. 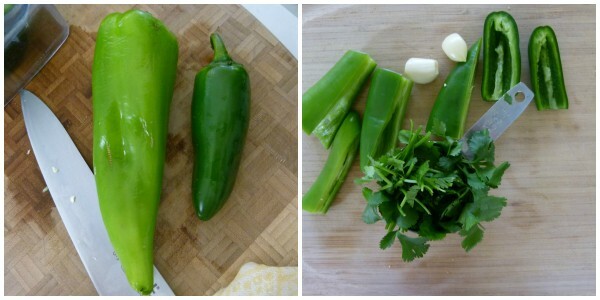 Chop the remaining ¼ cup fresh cilantro and stir into the pot. Taste for seasoning. Serve posole with suggested garnishes. *To cook dry hominy, soak in lots of water 6 hours or overnight. Drain and cook in a pot with fresh water. Bring to a boil, lower heat to a simmer, and cook for about 90 minutes to 2 hours or until tender. Drain and it is now ready to use. Hi Pamela – This sounds / looks DELISH! Can I make this in a Slow Cooker? Well, I guess so. But you would still need to make the tomatillo base on the stove. Once you have that made, the stew really only takes 10 minutes, so I’m not sure you would really gain much by doing it in a slow cooker unless you were starting with dried hominy. If you did it in a slow cooker, use a little less liquid to account for the fact that there is no evaporation in a slow cooker. Looks so yummy! is there a sub for hominy? Sure, but then it’s not posole! 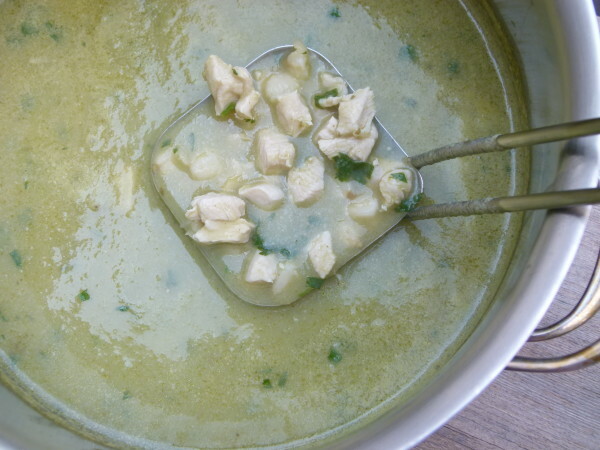 If you sub cooked beans (white or pinto) plus some corn kernels, you’ll have a great chicken chili verde! DELICIOUS!!!! A+++++++ Thank you Pamela! Hi Pamela. My family loves all of your recipes! This looks delicious. I just made your slow cooker chicken for tacos. Could you do this in the slow cooker as well? Whole family loved this!!! Thank you! This looks delicious! Quick question: is the chicken pre-cooked or does it cook in the process? Thank you! Thank you!!! My mom makes red posole every Christmas Eve. She adds pinto beans — not traditional, but so good. I’ve been wanting to make it, but she doesn’t really have a recipe. I can’t wait to try this.